"It's an unbelievable amount of money," Sanders told the author. "Is this going to go on forever? Do we really need to spend more than the next ten nations combined on the military, when our infrastructure is collapsing and kids can't afford to go to college?" 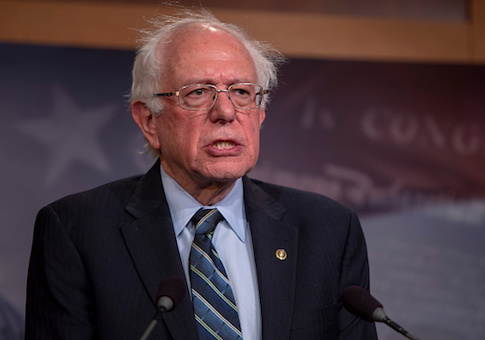 Wells then noted how Sanders mentioned an amendment he had offered that would have required one tenth of one per cent of the defense budget "to support exchange programs to bring foreign teenagers to the U.S. and send American kids abroad." Sanders recalled a program he oversaw as the mayor of Burlington, Vt., in the 1980s, in which kids from his city went to the Soviet city of Yaroslavl, and Russian children went to Burlington. "It was just an incredible experience to see these kids getting along as well as they did," Sanders said. "You know, a lot of attitudes about foreign policy are based on lack of knowledge." "To bring farmers from Turkey to farmers in Iowa. You know, just to get people to see each other as human beings," the senator added. "I think it could go a distance." This entry was posted in National Security and tagged Bernie Sanders, Defense Budget, Foreign Policy, Military. Bookmark the permalink.